Is Kohl’s Corporation (NYSE:KSS) a good stock to buy now? Prominent investors are turning less bullish. The number of bullish hedge fund positions dropped by 2 in recent months. Our calculations also showed that KSS isn’t among the 30 most popular stocks among hedge funds. We’re going to check out the key hedge fund action encompassing Kohl’s Corporation (NYSE:KSS). What have hedge funds been doing with Kohl’s Corporation (NYSE:KSS)? Heading into the first quarter of 2019, a total of 27 of the hedge funds tracked by Insider Monkey held long positions in this stock, a change of -7% from the previous quarter. 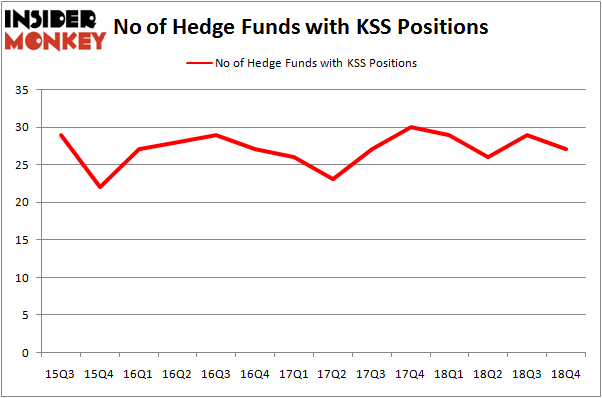 The graph below displays the number of hedge funds with bullish position in KSS over the last 14 quarters. With hedgies’ capital changing hands, there exists an “upper tier” of key hedge fund managers who were adding to their stakes substantially (or already accumulated large positions). Of the funds tracked by Insider Monkey, AQR Capital Management, managed by Cliff Asness, holds the largest position in Kohl’s Corporation (NYSE:KSS). AQR Capital Management has a $542.1 million position in the stock, comprising 0.6% of its 13F portfolio. The second largest stake is held by Renaissance Technologies, managed by Jim Simons, which holds a $261.6 million position; the fund has 0.3% of its 13F portfolio invested in the stock. Remaining members of the smart money with similar optimism include Robert Pohly’s Samlyn Capital, John Overdeck and David Siegel’s Two Sigma Advisors and Ken Griffin’s Citadel Investment Group. 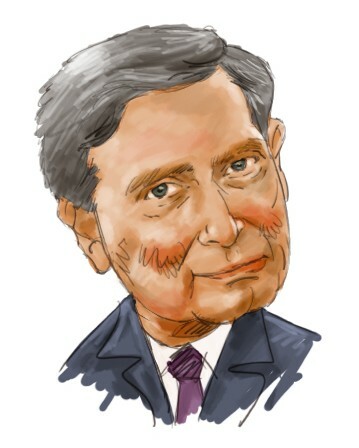 Due to the fact that Kohl’s Corporation (NYSE:KSS) has experienced a decline in interest from the aggregate hedge fund industry, it’s easy to see that there exists a select few hedge funds that elected to cut their positions entirely last quarter. It’s worth mentioning that Per Johanssoná’s Bodenholm Capital said goodbye to the biggest stake of the 700 funds tracked by Insider Monkey, valued at an estimated $9.2 million in stock. Jeffrey Talpins’s fund, Element Capital Management, also sold off its stock, about $7.8 million worth. These transactions are interesting, as aggregate hedge fund interest dropped by 2 funds last quarter. Let’s check out hedge fund activity in other stocks – not necessarily in the same industry as Kohl’s Corporation (NYSE:KSS) but similarly valued. These stocks are Cboe Global Markets, Inc. (NASDAQ:CBOE), UDR, Inc. (NYSE:UDR), Mid America Apartment Communities Inc (NYSE:MAA), and Atmos Energy Corporation (NYSE:ATO). All of these stocks’ market caps are closest to KSS’s market cap. As you can see these stocks had an average of 22.5 hedge funds with bullish positions and the average amount invested in these stocks was $528 million. That figure was $1032 million in KSS’s case. Atmos Energy Corporation (NYSE:ATO) is the most popular stock in this table. On the other hand UDR, Inc. (NYSE:UDR) is the least popular one with only 20 bullish hedge fund positions. Compared to these stocks Kohl’s Corporation (NYSE:KSS) is more popular among hedge funds. Our calculations showed that top 15 most popular stocks among hedge funds returned 19.7% through March 15th and outperformed the S&P 500 ETF (SPY) by 6.6 percentage points. Unfortunately KSS wasn’t in this group. Hedge funds that bet on KSS were disappointed as the stock returned 2.5% and underperformed the market. If you are interested in investing in large cap stocks, you should check out the top 15 hedge fund stocks as 13 of these outperformed the market. Were Hedge Funds Right About Souring On Vornado Realty Trust (VNO)? Is Seagate Technology (STX) A Good Stock To Buy? Hedge Funds Haven’t Been This Bullish On DexCom, Inc. (DXCM) Since 2015... Were Hedge Funds Right About Flocking Into Marvell Technology Group (MRVL)? Were Hedge Funds Right About Dumping Elanco Animal Health Incorporated (ELAN... Do Hedge Funds Love Lincoln National Corporation (LNC)?